After researching the Andy Cutler protocol for heavy metal chelation, I stumbled onto a thread that talked about Hevenly Heat infrared saunas. I love the concept, and the built quality of the cabinetry from the photos, but am still hesitant between the carbon vs ceramic debate. However, of the ceramic powered infrared brands that I’ve seen, Heavenly Heat looks to be one of the better quality units. Only trouble is I can’t find any youtube videos where a customer has gone through the sauna with a good set of meters to see if it’s really low emf or not. I tried searching through reviews from other bloggers that bought one, but still cannot find any emf specific review. 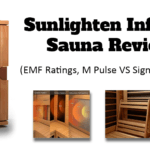 After already having been taken to the cleaners on the JNH Lifestyles “NO EMF” marketing scam, and the flat out lies behind the Dynamic “low emf” infrared sauna (with over 100+ milliguass readings in it), it’s safe to say I’m skeptical of every sauna company marketing claim now… And wondering how many more thousands of dollars I’m going to have to waste in order to find a good solution, that’s actually honest about their emitter output. I’d love to get my hands on one of these, but truth be told, I’ve already bought three saunas this month, and have some decent money outlayed thus far. I’ll have to wait a month or two before I can afford to buy the next round of saunas, since I can’t keep spending $10k + every two weeks just try out another **hopefully not whitelabled import from China** sauna. If you know of anyone in the Orlando area that has a Heavenly Heat, and would be open to letting me pay to use it, please reach out!